The Washington Square Outdoor Art Exhibit Spring 2010 Show begins Memorial Day Weekend, May 29, 30, 31, and continues on the following weekend, June 5, 6. Exhibition hours are noon to six pm on all days. The show takes place on the sidewalks of University Place, from East 10th Street south along the side of Washington Square Park, through Schwartz Plaza (Bobkin Lane) to West 3rd St. The show is now in its 80th year; come and be part of the tradition! For those of you on Facebook come and join the WSOAE fan group. 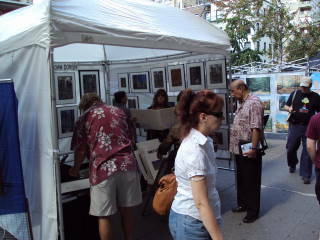 Just click on the Facebook image on the right to go to the Washington Square Outdoor Art Exhibit page. Become a “fan” and use the “Wall” to post information about your activities and shows. You can also upload pictures. The WSOAE community on Facebook is a place where we can post items of interest, and you can share your information with other artists and WSOAE followers.